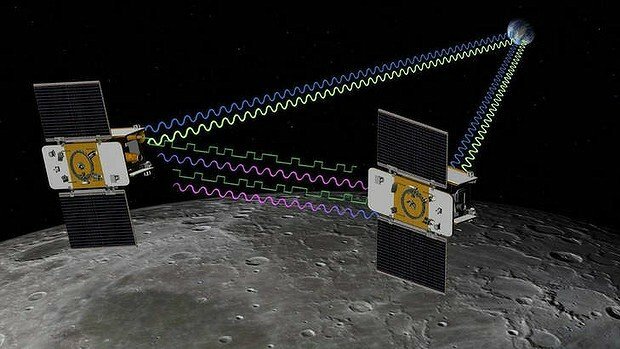 Home Tags Posts tagged with "mission to the moon"
NASA’s Ebb and Flow gravity mapping twin satellites have ended their mission to the Moon. Ebb and Flow were commanded to slam into a 2 km-high mountain in the far lunar north. The deliberate ditching avoids the possibility of an uncontrolled descent on to locations of historic importance, such as the Apollo landing sites. NASA’s deep-space radio-tracking system confirmed the loss of signal from the satellites just before 22:30 GMT. Afterwards, it was announced the impact site would be named for Sally Ride, the first female American astronaut who died earlier this year. Sally Ride’s educational programme had run the outreach cameras on the spacecraft. The satellite twins returned some remarkable data during their operational mission, which got under way in March. Their maps of the subtle variations in gravity across the Moon’s surface are expected to transform many areas of planetary science. “Ebb and Flow have removed a veil from the Moon and removing this veil will enable discoveries about the way the Moon formed and evolved for many years to come,” said principal investigator Prof. Maria Zuber from the Massachusetts Institute of Technology, US. Together known as Grail (Gravity Recovery and Internal Laboratory), the pair hit the flank of the lunar-nearside mountain about 3 km and 30 seconds apart. The peak – located at 75 degrees North latitude close to a crater named Goldschmidt – was in darkness at the time. Being only the size of washer-driers, and having completely depleted their fuel tanks, the pair were not expected to produce any sort of impact flash visible to Earth observers. That said, another of NASA’s missions at the Moon, its Lunar Reconnaissance Orbiter (LRO), was looking out for the crashes. If it was lucky, LRO’s ultraviolet imager might have seen some volatile materials being driven off the surface by the heat from the impacts. The orbiter will also image the site in a couple of weeks to see if it can discern any new craters. The Grail mission has produced the highest resolution, highest quality global gravity maps for any planetary body in the Solar System, including Earth. The gravity differences the satellites have measured are the result of an uneven distribution of mass across the Moon. Obvious examples at the surface include big mountain ranges or deep impact basins, but even inside the lunar body the rock is arranged in an irregular fashion, with some regions being denser than others. Much of the twins’ data has yet to be analyzed but already scientists are getting some tantalizing new insights into the Moon’s structure and history. “One of the major results that we’ve found is that the lunar crust is much thinner than we had believed before, and that a couple of the large impact basins probably excavated the Moon’s mantle, which is very useful in terms of trying to understand the composition of the Moon as well as the Earth, because we actually think that the Earth’s mantle has a similar composition to the Moon’s mantle,” said principal investigator Prof. Maria Zuber from the Massachusetts Institute of Technology, US. The gravity data also shows the lunar body’s top-most layers to be far more fractured than anyone had previously suspected. These pulverized and porous materials that coat the surface bear witness to the brutal battering the Moon received in the first few hundred million years of its existence. In addition, Ebb and Flow found evidence for great lava-filled fissures just under all this impact debris. These dykes, some hundreds of km long, appear to reach deep into the Moon, and may hint at an early expansion phase in its history when the hot body expanded outwards, before eventually cooling and contracting. Grail data will be critical in tying down ideas for how the Moon came into existence. The dominant theory calls for a giant impact billions of years ago between the Earth and a Mars-sized object which threw material into space that ultimately coalesced into the familiar body we recognize in the sky today. Some scientists have argued that Earth may once even have had two moons which later merged – although the Grail data could have sunk this idea. “We have looked for evidence of the second moon and we have not seen any of the suggested characteristics of the internal structure of the Moon that would be consistent with the idea of a second companion,” said Prof. Maria Zuber.